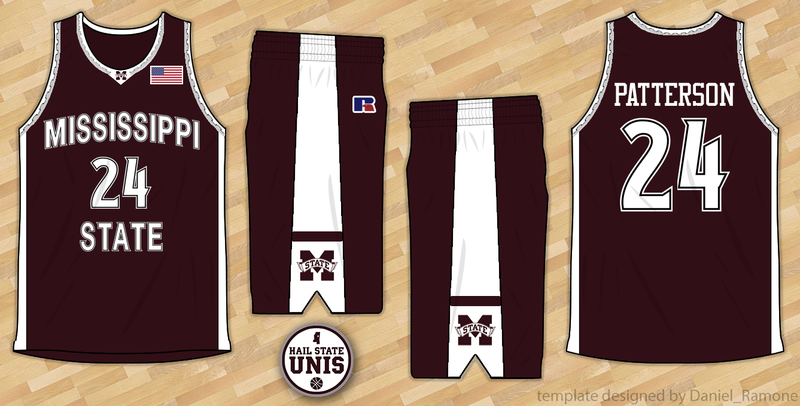 This page contains a record of every men's basketball uniform Mississippi State has worn since the 1956-1957 season. 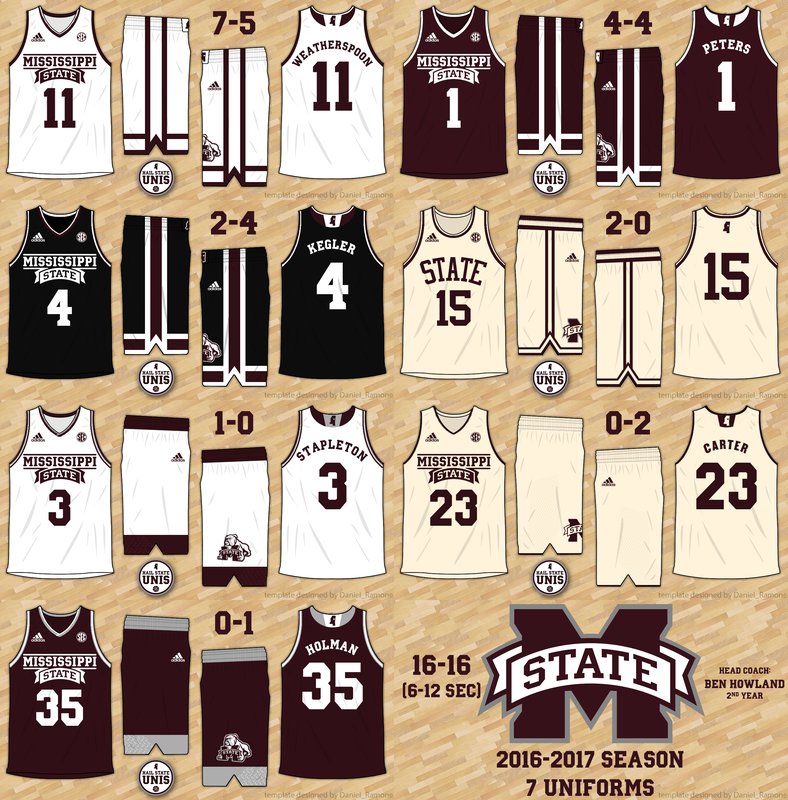 Mississippi State made its return to the NCAA Tournament in 2019, making its first appearance since 2009. 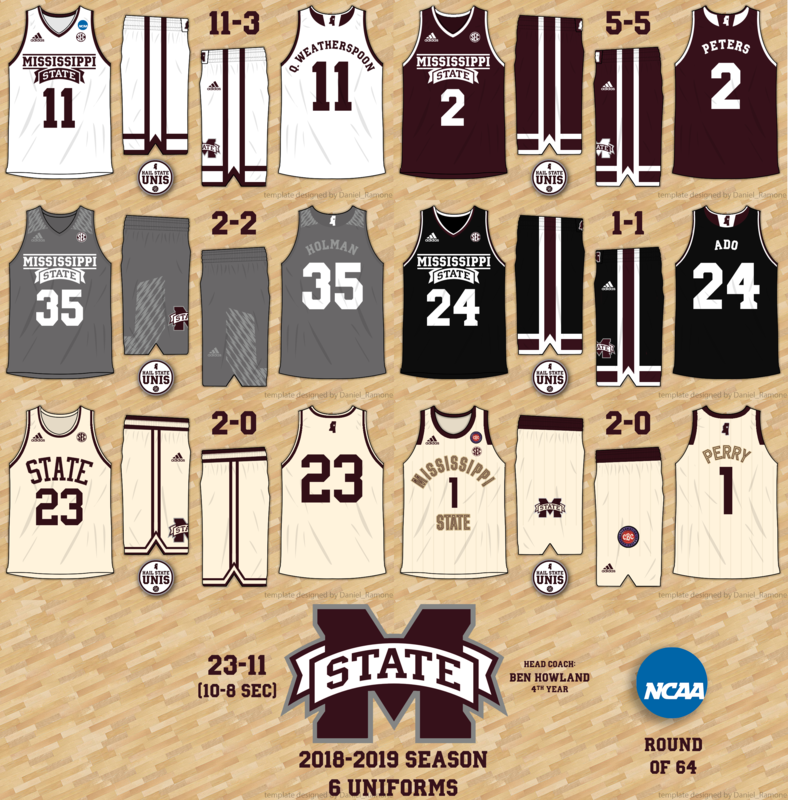 As a 5 seed, the Bulldogs fell victim to the 5/12 curse and lost to Liberty in the Round of 64. 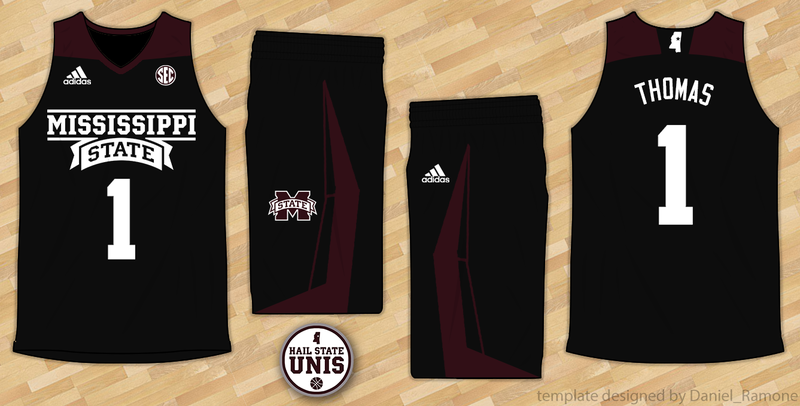 ​Mississippi State's uniforms remained the same for the most part in 2019; there was one completely new uniform, the "Harlem" look, which was part of Adidas's "Celebrating Black Culture" uniform series. 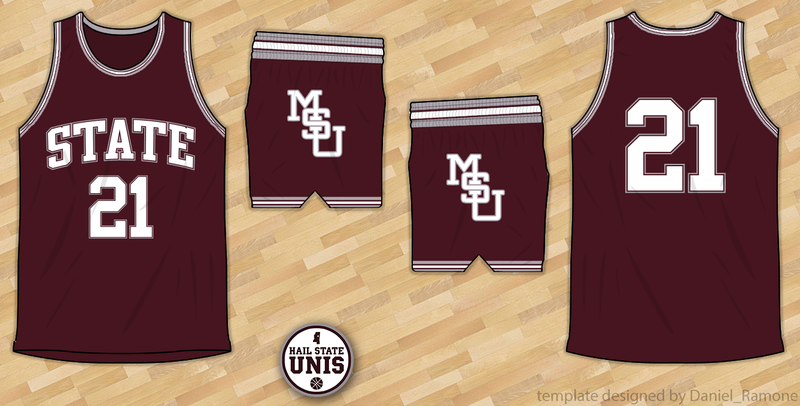 There were, however, tweaks to the shorts on four of the uniforms: on the white, maroon, and black shorts, the M-State logo replaced the Bulldog logo, and on the cream shorts, the player number was removed, reverting those uniforms back to their 15/16 and 16/17 design. 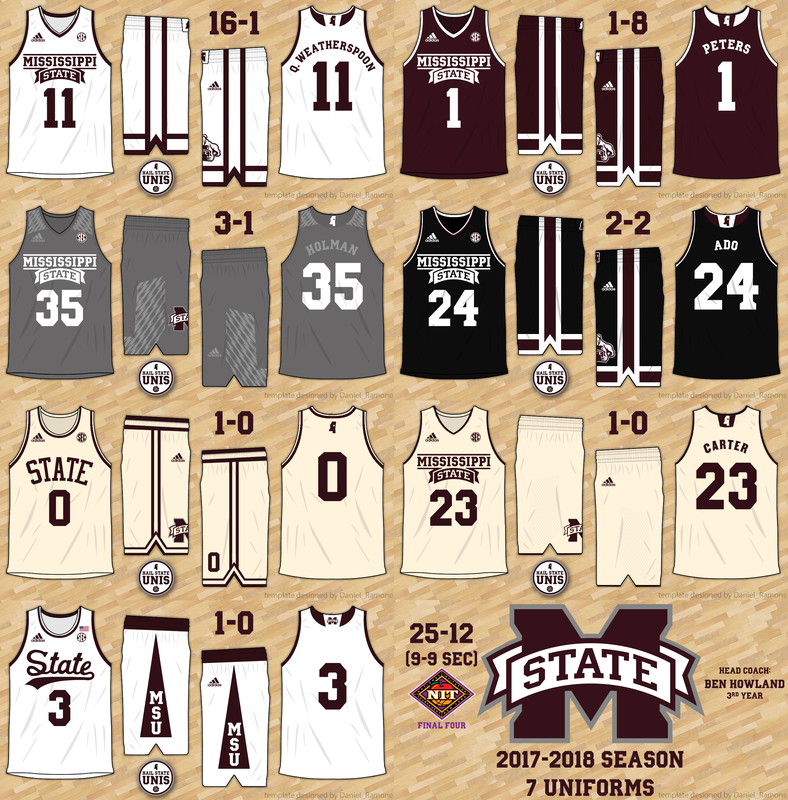 In 2018, Mississippi State returned to the postseason for the first time since 2012, reaching the NIT semifinals following wins over Maryland, Baylor, and Louisville. 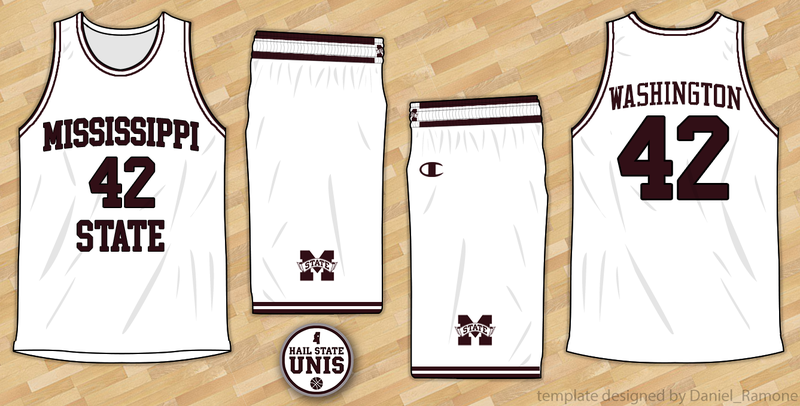 The Bulldogs' primary uniforms from the 2016-17 season returned in 2017-18, along with the cream "State" throwbacks and "Iced Out" alternates. Two new uniforms were introduced: a gray uniform with a white wordmark/numbers and a new throwback uniform: white with a "State" script on the chest and "MSU" on the shorts. The script throwback is based on the uniforms worn from 1974-75 until 1976-77. 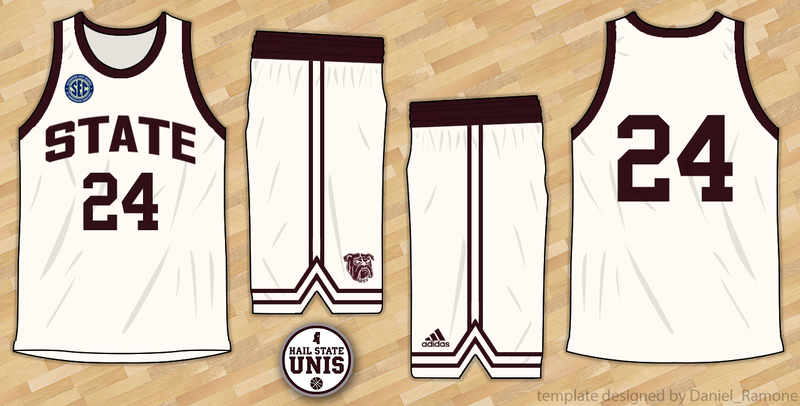 In 2017, the Bulldogs upgraded to a cleaner and more unique primary uniform design. 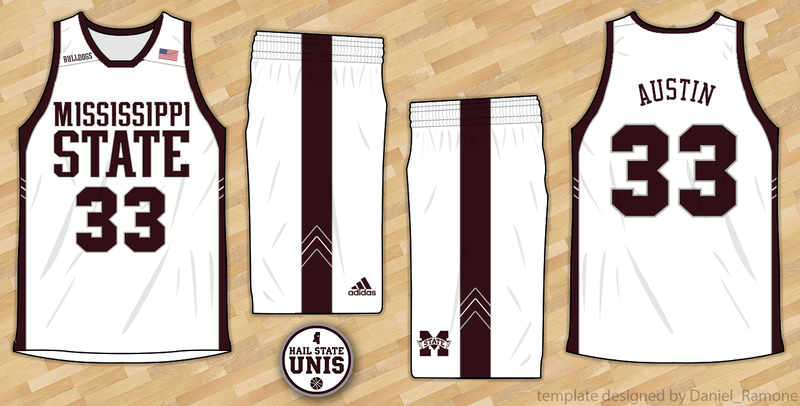 The stripe design on the shorts featured thick stripes that form a ribbon shape at the bottom. The jersey, devoid of contrasting shoulders, were much cleaner than their predecessors. 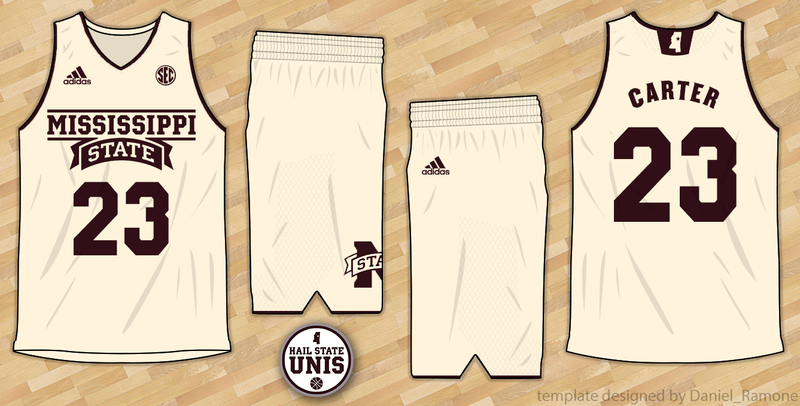 The cream throwbacks from 14-15 were retained, and a new Adidas "Iced Out" alternate was added. 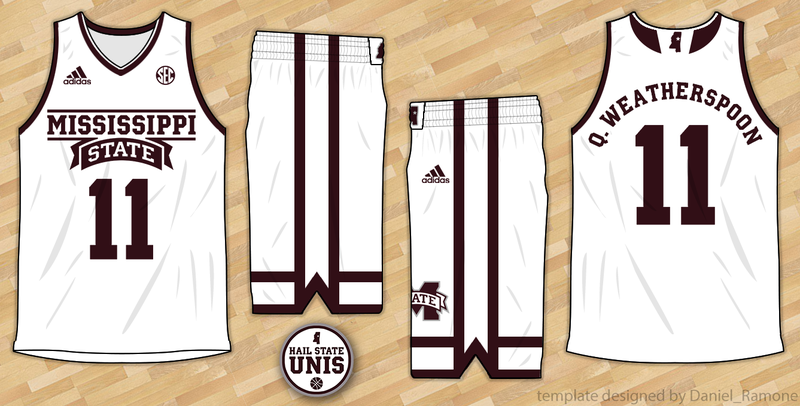 In the 2017 SEC Tournament, the Bulldogs once again wore Adidas "Made in March" uniforms, this time getting to wear both the white and maroon versions. 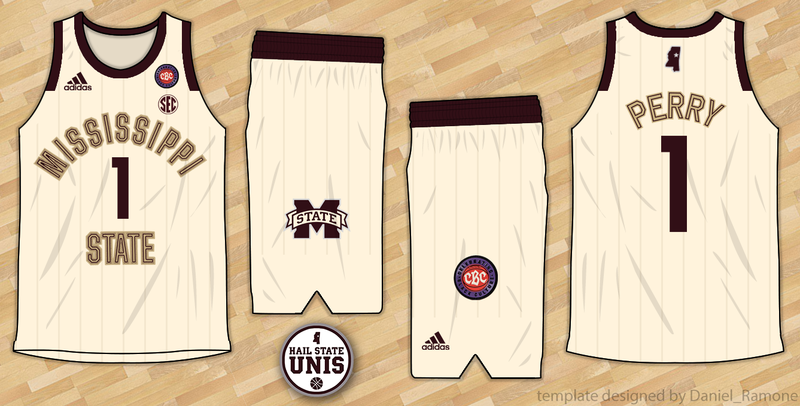 In Ben Howland's first season as head coach, the regular uniforms from the previous season were retained, but the cream throwbacks were altered to reflect the jersey design worn from 1960-65, most notably in the "Game of Change". 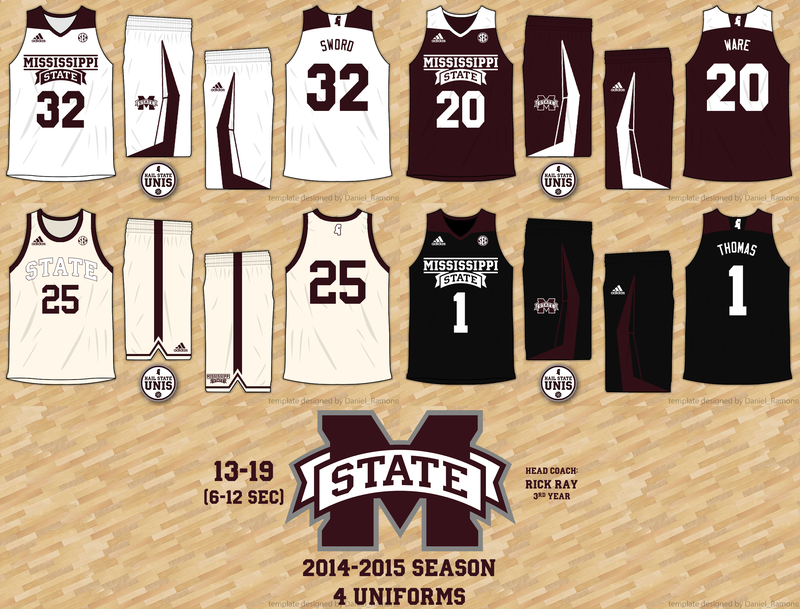 In the 2016 SEC Tournament, Mississippi State wore special maroon Adidas "Made in March" uniforms. 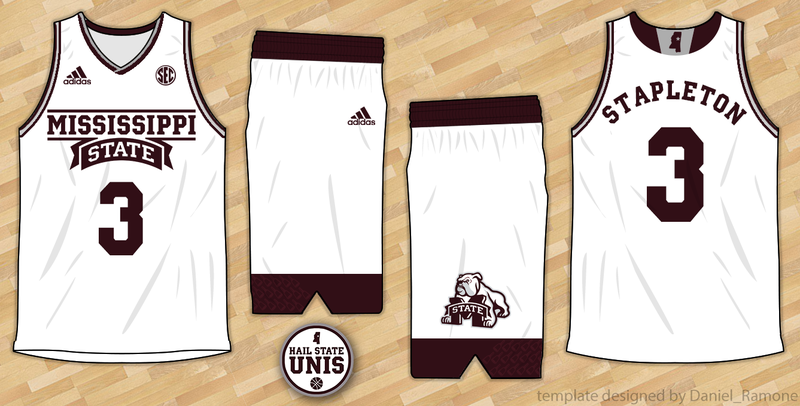 In 2014-15, the Bulldogs updated to a newer Adidas template, with contrasting shoulder tops and a new shorts design. 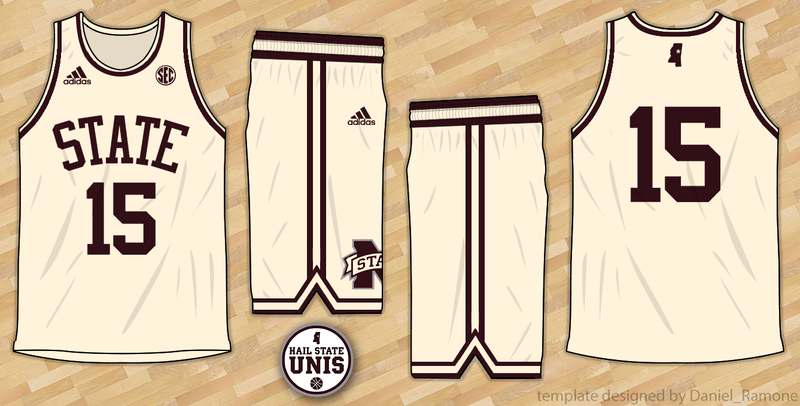 For the first time since since the 05-06 season, the Bulldogs wore cream fauxback jerseys. 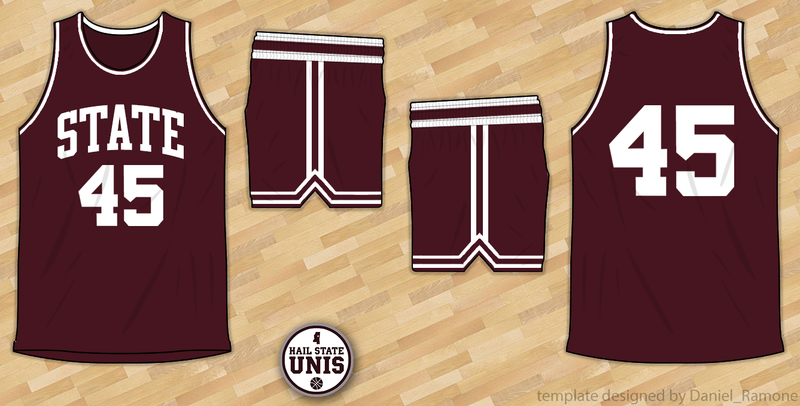 The 14-15 versions featured a white "State" wordmark outlined in maroon and a ribbon stripe on the shorts. 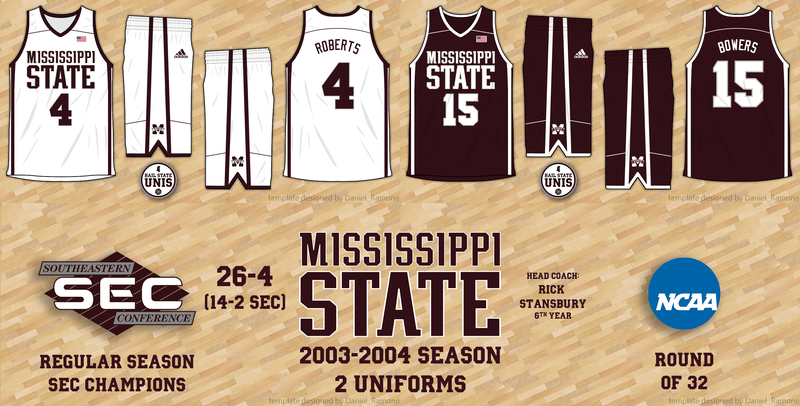 Following the end of the Rick Stansbury Era at the end of the 2011-12 season, Mississippi State hired Rick Ray as his replacement. In the Bulldogs' first season under Ray, they got uniforms in a template similar that worn by most Adidas college basketball teams that season. 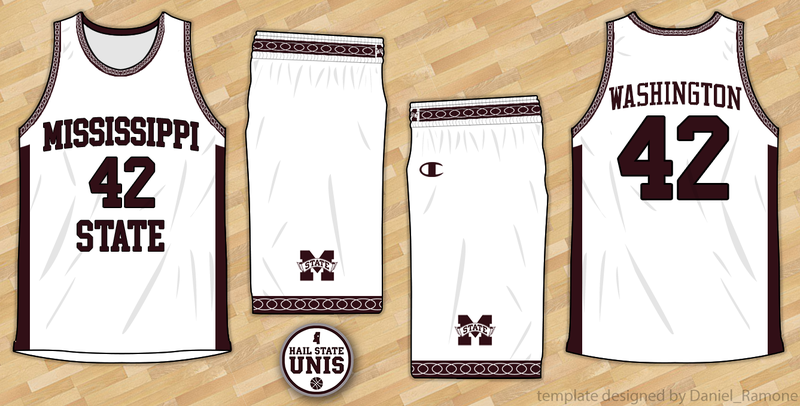 Featuring a gradient design on the shorts, a "dog bone" pattern on the front shoulder, and thin piping on the side of the jersey, the biggest change with these uniforms was the presence of the "Mississippi State" banner logo on the chest. 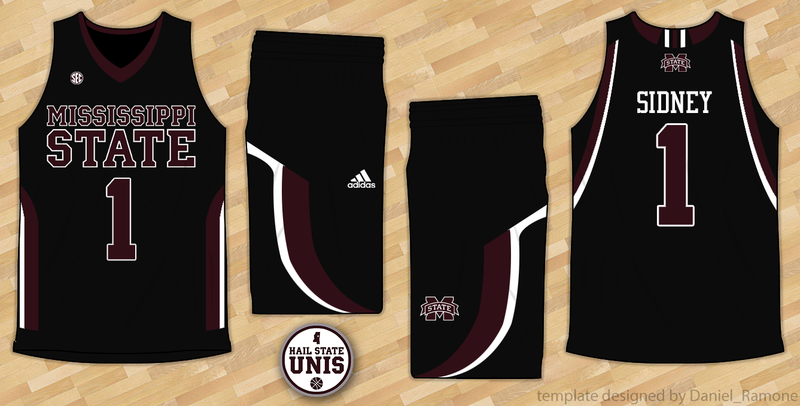 The Women's team had adopted the wordmark as soon as Adidas took over the Bulldogs' uniforms in 2009-10, but Stansbury had held it off of the Men's uniforms. 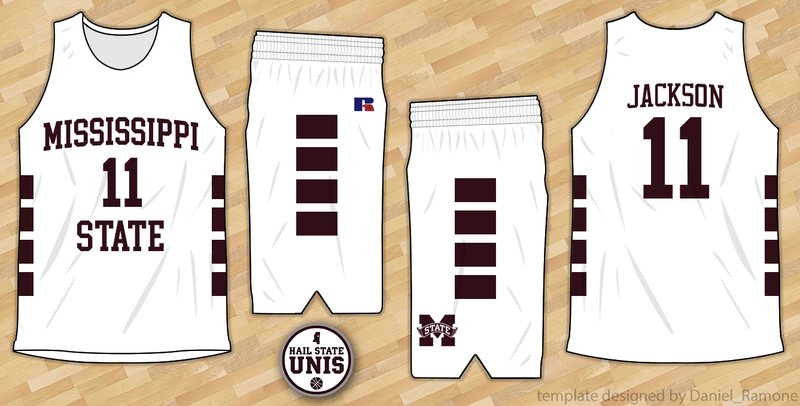 ​Just like in 2012, the Bulldogs had four different color uniforms, all following the same template: white, maroon, light gray, and black. 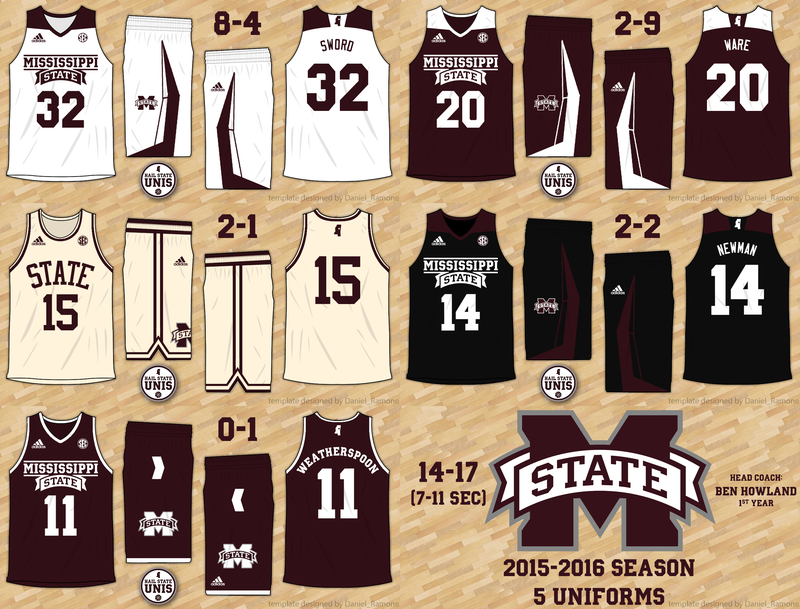 The Bulldogs wore the same four uniform combinations in both of Ray's first two seasons. 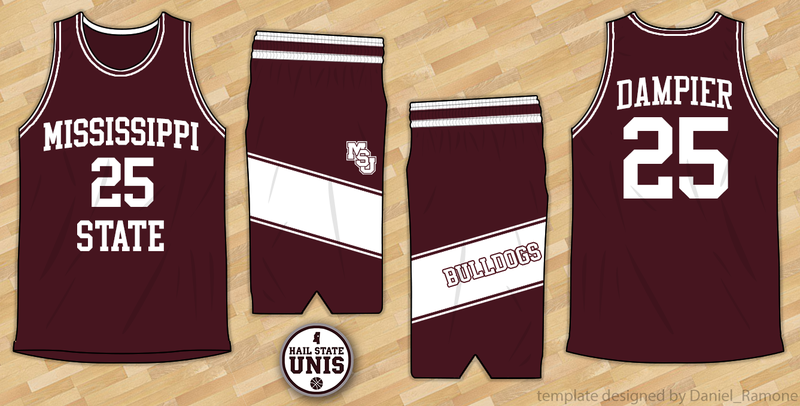 In Rick Stansbury's final season as head coach, the Bulldogs added gray alternate uniforms for the first time since the late 80s/early 90s. 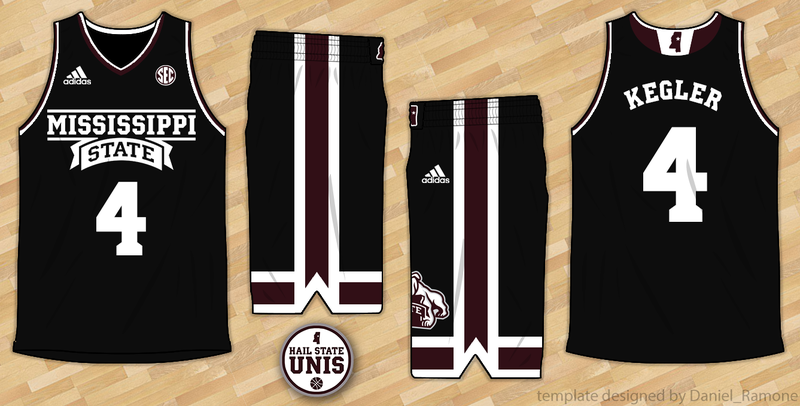 The design followed the same template as the Bulldogs' other three uniforms and was pretty much just the black uniform with all of the black replaced with gray. 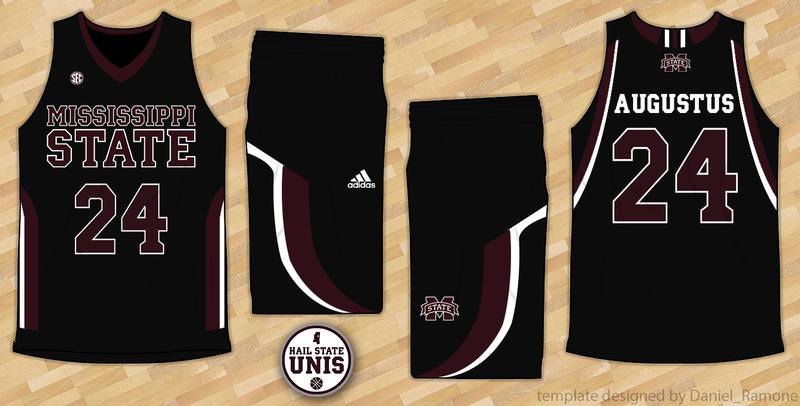 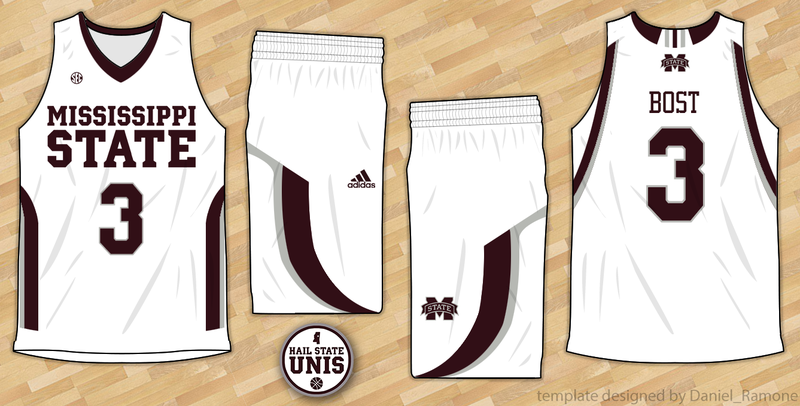 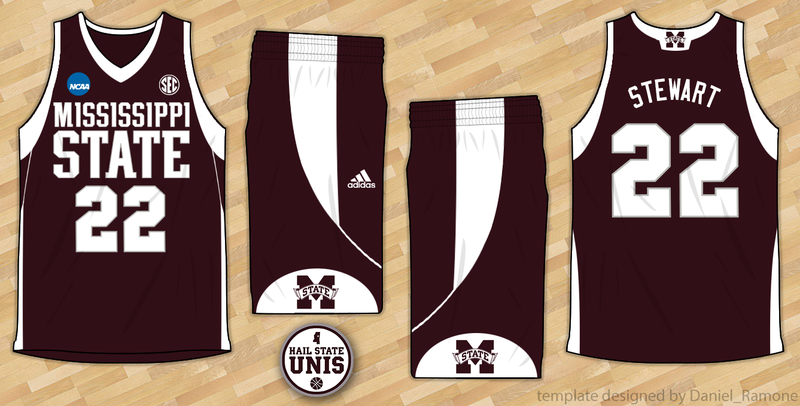 With Adidas taking over as Mississippi State's uniform supplier for all sports in the summer of 2009 (the basketball team already wore Adidas), the basketball jerseys had updated wordmarks; the "stacked" style remained, but was modified to match the university's new custom font. 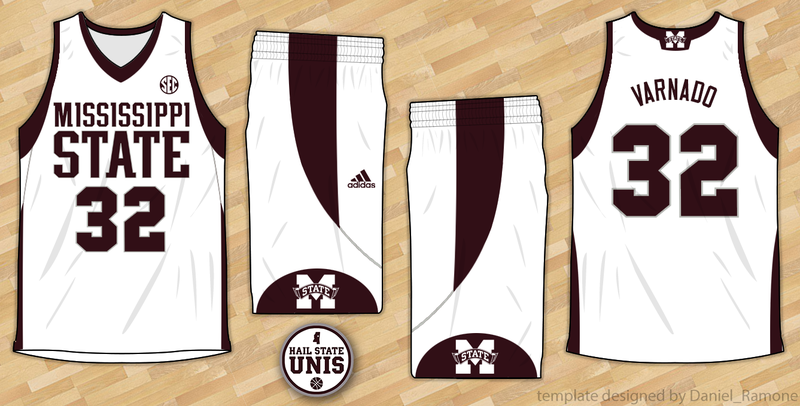 The jersey and shorts featured an odd striping pattern as well as the Adidas "three stripes" on the back of the collar. Against Kentucky in 2010, the Bulldogs wore black uniforms for the first time in the modern era. 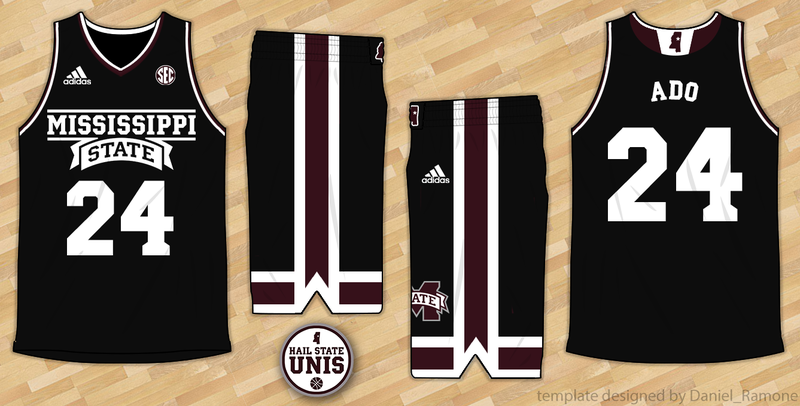 Following the same template as the white and maroon uniforms, the black jerseys featured maroon numbers/wordmark outlined in white. 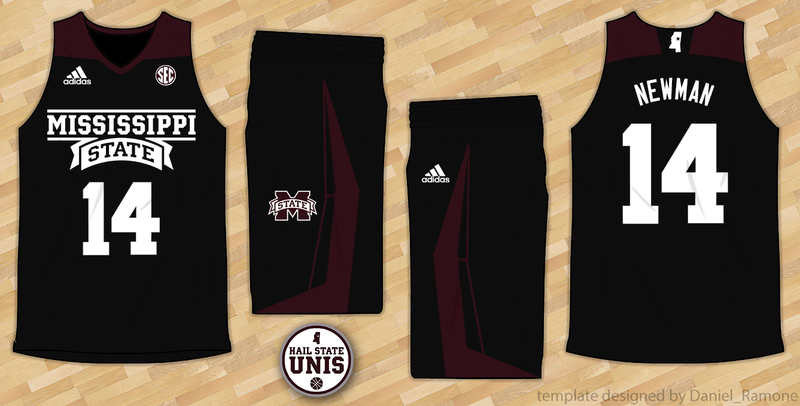 The Bulldogs wore the same three uniforms in both the 09-10 and 10-11 seasons, wearing black in a win over Arkansas in 2011. 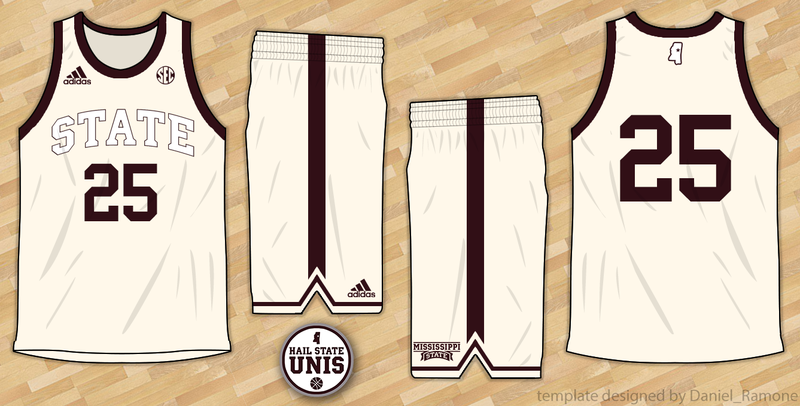 The Bulldogs updated their uniforms for the first time in two years prior to the 08-09 season. With a baggy fit, wide collar and sleeve stripes, and a thick stripe down the side, these were the some of the Bulldogs' busiest uniforms. 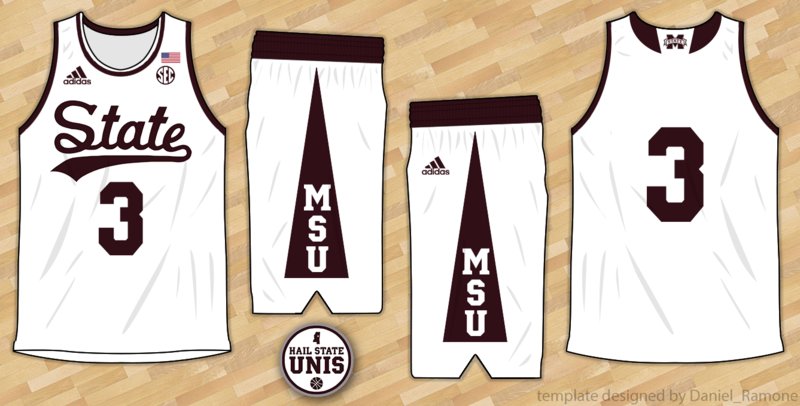 The wordmark and number font were the same as the previous few seasons; the M-State logo appeared on the bottom of the shorts and back of the collar. 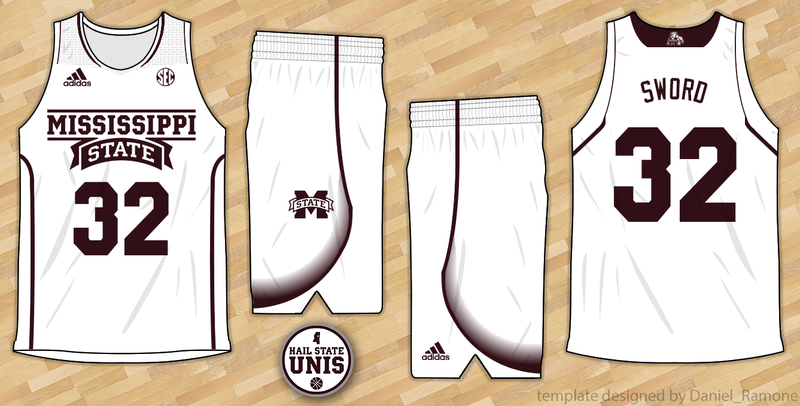 ​Only worn for one season, these are most memorable for being worn in the Bulldogs' 2009 SEC Tournament championship run. 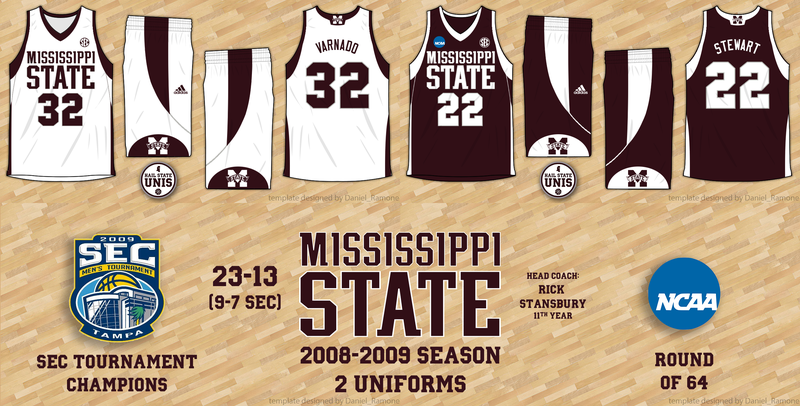 Prior to the 06-07 season, the side panel and shorts stripes were simplified, while the wordmark, number font, and collar/sleeve striping remained the same. The result was a much less busy look, arguably the best of the Stansbury Era. Along with every other SEC team, Mississippi State wore throwback uniforms in 2006 to commemorate the 80th season of SEC Basketball. 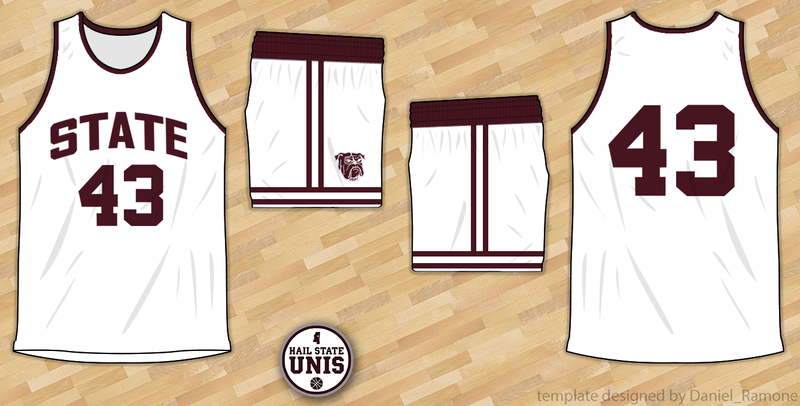 Modeled after uniforms worn from 1969 to 1970, the throwbacks featured "State" on the chest and traditional striping, along with a Bulldog logo, on the shorts. 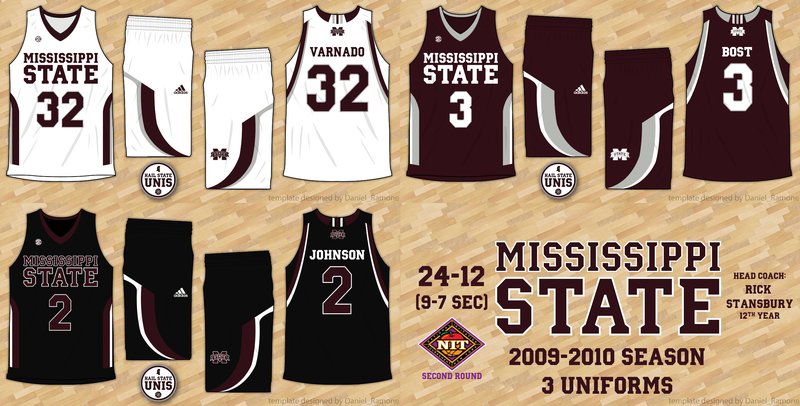 The regular uniforms remained the same as in 04-05; this was the first season since the 92-93 season in which the Bulldogs did not have new regular uniforms. For the 04-05 season, the Bulldogs updated their uniforms to feature a more complex striping pattern on the side panels and sleeve/collar cuffs, incorporating more gray into the uniforms as an accent color. In the Bulldogs' 2004 SEC Regular Season Championship season, the "stacked" wordmark remained on the uniforms, while simple double stripes were added to the sides and shorts. 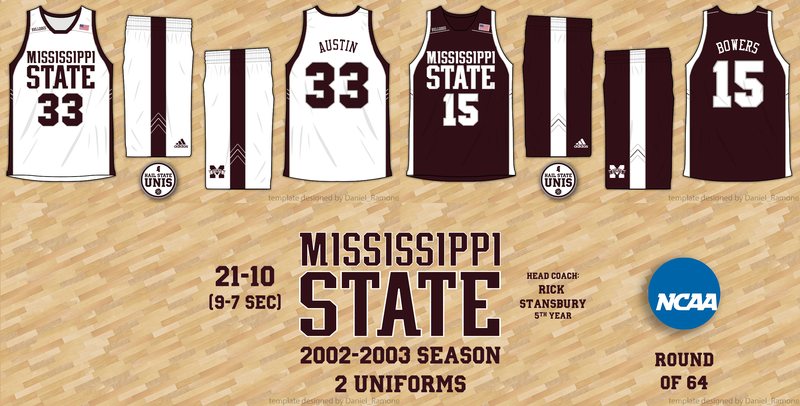 Mississippi State wore Adidas basketball uniforms for the first time in the 02-03 season, resulting in a drastic upgrade over the 01-02 Russell Athletic uniforms. 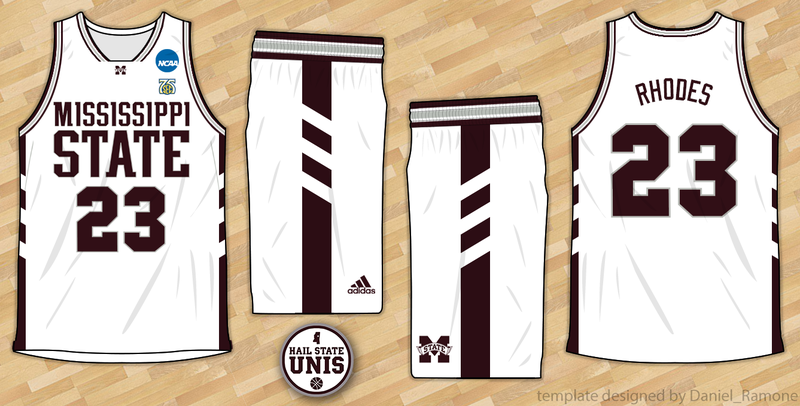 The first Adidas uniforms were the first to feature the "stacked" wordmark that would remain on the jerseys for the rest of the decade. 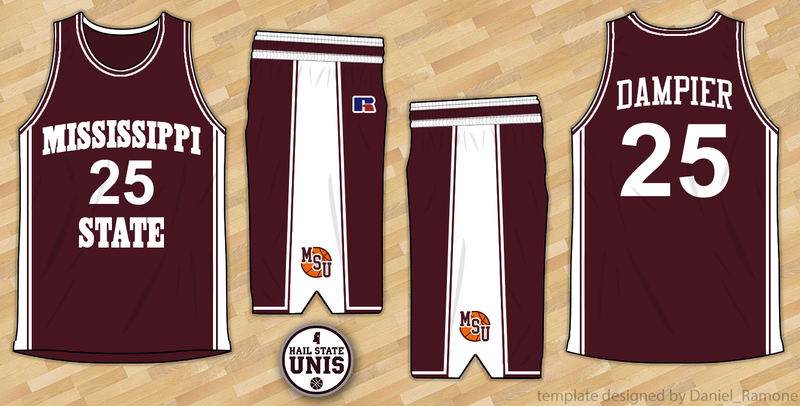 Featuring the Russell Athletic "Viper" font, the 01-02 uniforms were... not the best Mississippi State basketball history. 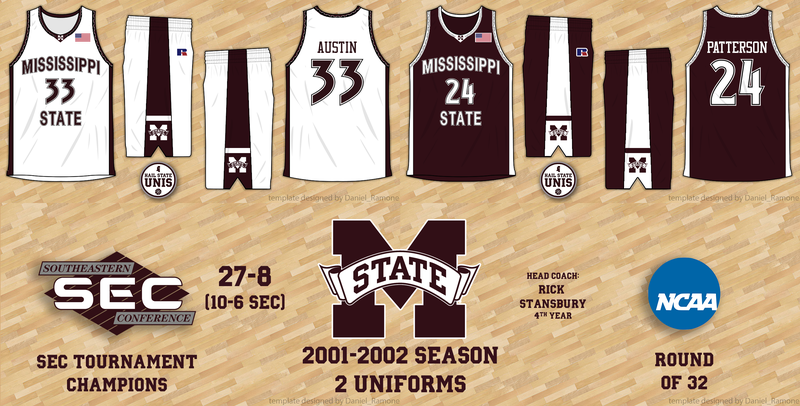 Worn in the Bulldogs' 2002 SEC Tournament Championship, the uniforms had an odd collar/sleeve pattern and used black as an accent color in addition to the ridiculous wordmark/number font. The 00-01 uniforms kept the standard block font for the numbers and wordmark, but featured a triangle pattern on the side panel and sleeve/collar. 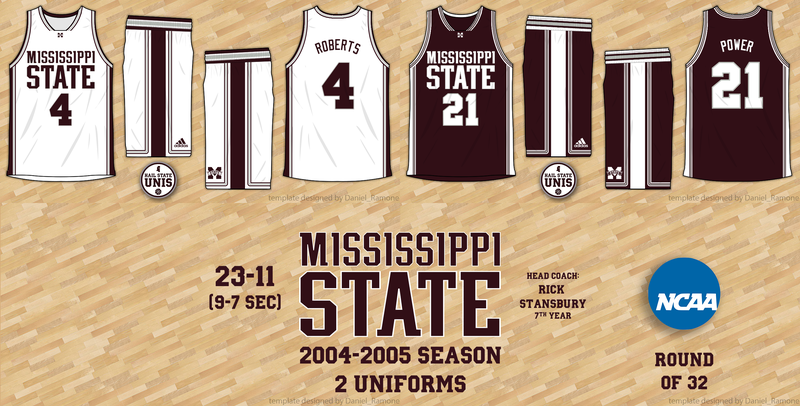 Mississippi State Basketball went back to Russell Athletic in Stansbury's second season; the result was uniforms that were very plain, with a simple block font, no sleeve/collar stripes, and 4 rectangles on the sides of both the jersey and shorts. 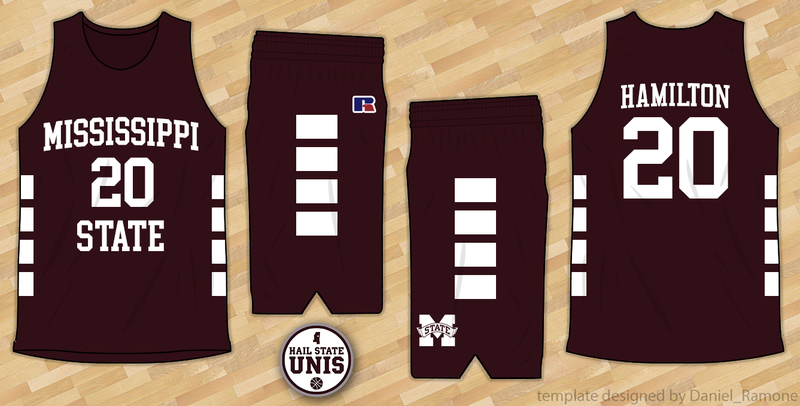 In Rick Stansbury's first season as head coach, the Bulldogs' uniforms featured block numbers/lettering and a circly-pattern on the collar/sleeve cuffs, waistband, and shorts bottom. 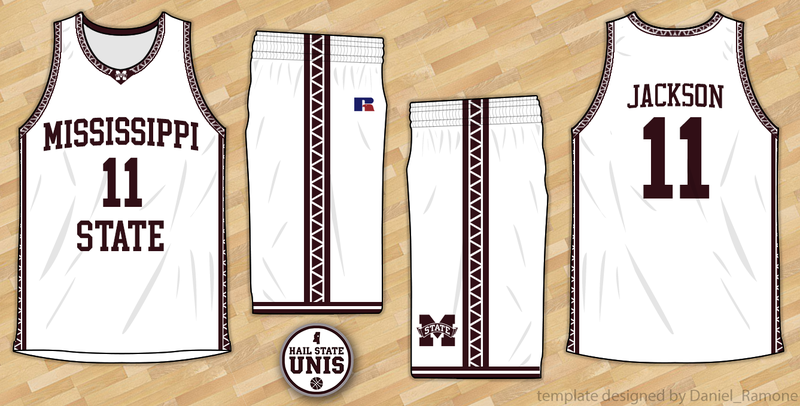 In the final season of the Richard Williams Era, the Bulldogs wore uniforms with simple stripes on the collar/sleeve cuffs, waistband, and shorts bottom. Switching to Champion for the 96-97 season, the follow up to the Final Four season featured uniforms with contrasting side panels (with an inverted M-State logo near the bottom) and thin black outlines on the numbers / letters / side panels. 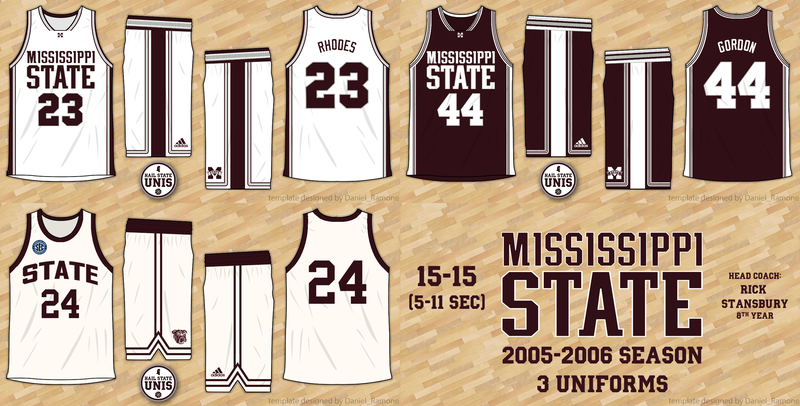 It's only fitting that Mississippi State's most successful team ever wore arguably the best uniforms in program history. 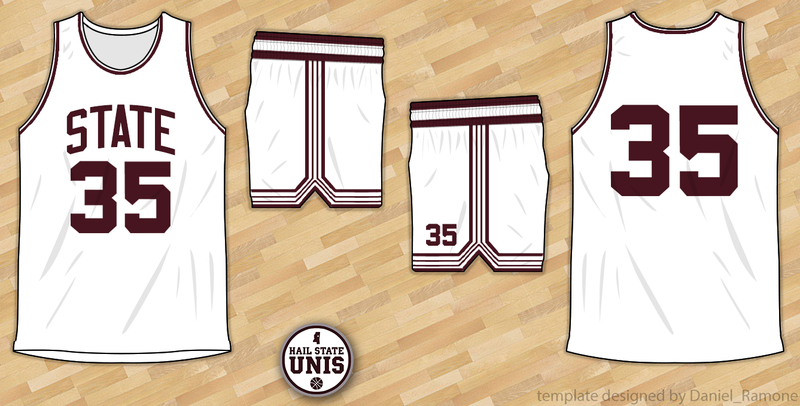 With a simple block font for lettering and numbers, a classic double stripe on the collar/sleeves/waistband, and traditional side panel striping, the 96 Final Four uniforms still look good today. The 94-95 uniforms, while very similar to the "Final Four" uniforms worn the following year, had a few quirks that set them apart. Though the collar, sleeves, waistband, and side panels featured the same design, the lettering on the front used a western-y font, while a thin and round font was used for the numbers. The best thing about the 94-95 uniforms was the diagonal "MSU" logo over a basketball on the side of the shorts. The 93-94 uniforms saw the return of the "Mississippi" above the number and "State" below the number style, which had last been worn in the 85-86 season. The shorts had a rather *innovative* design, with a large, diagonal stripe wrapping all the way around them. 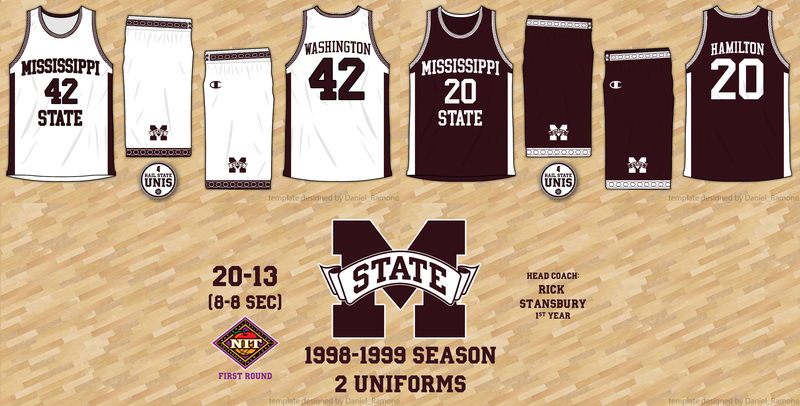 Note: Prior to the 1993-1994 season, uniform sets were worn for extended periods of time rather than changed after each season. As a result, this is where I stopped with graphics for individual seasons. 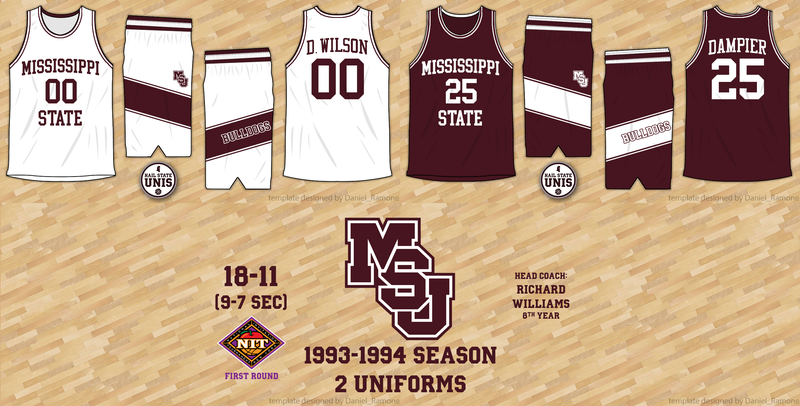 From 90-91 to 92-93, the Bulldogs wore fairly simple uniforms that followed the design of the 89-90 home uniforms, but with a diagonal "MSU" on the shorts. 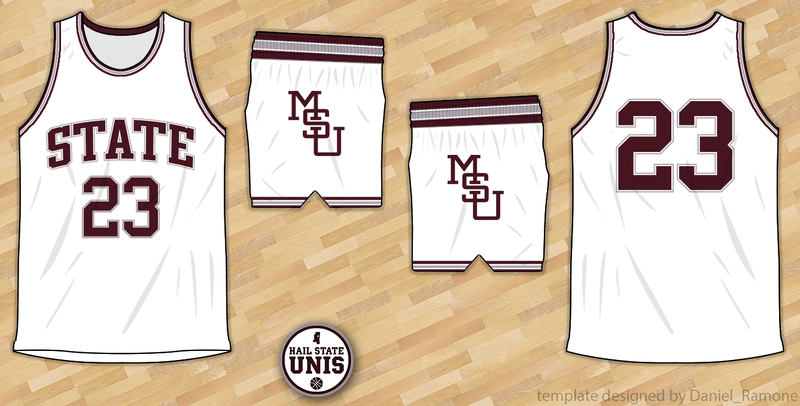 The uniforms had a "State" wordmark on the chest and featured double striping on the collar, neck, waistband, and bottom of the shorts. 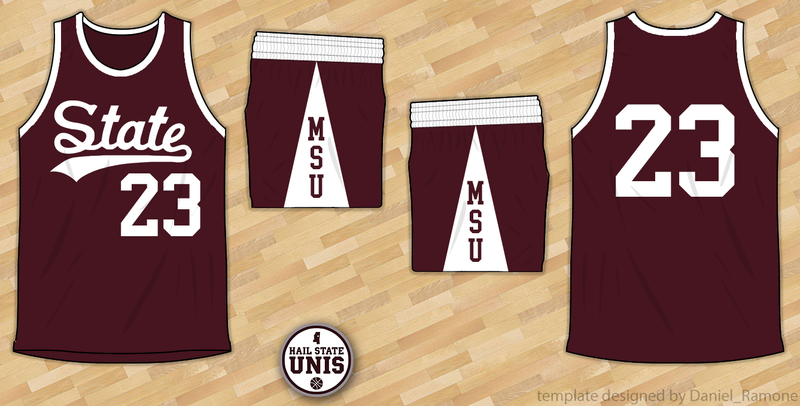 Everything, including the wordmark, numbers, and shorts logo, had a double outline. 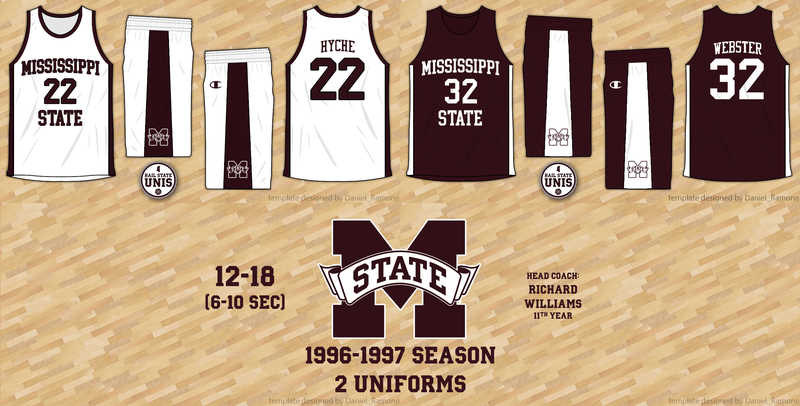 Richard Williams's first four seasons as head coach were a rather hectic time for State's uniforms. 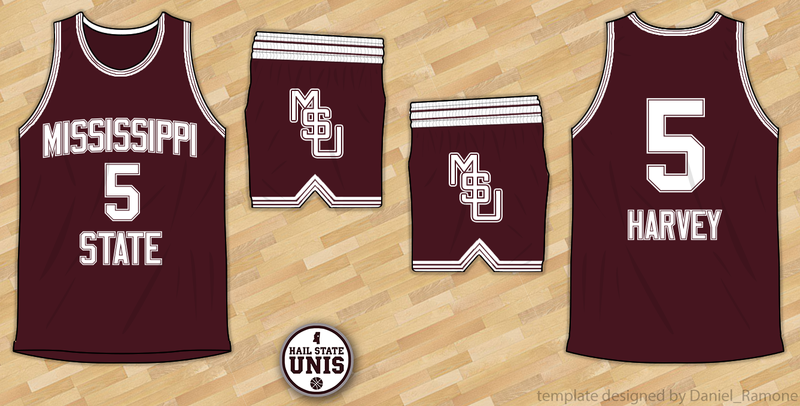 Going back to a simple "State" on the chest, the 86-87 uniforms featured an interlocking "MSU" shorts logo and maroon/gray striping on the waistband and shorts bottom. 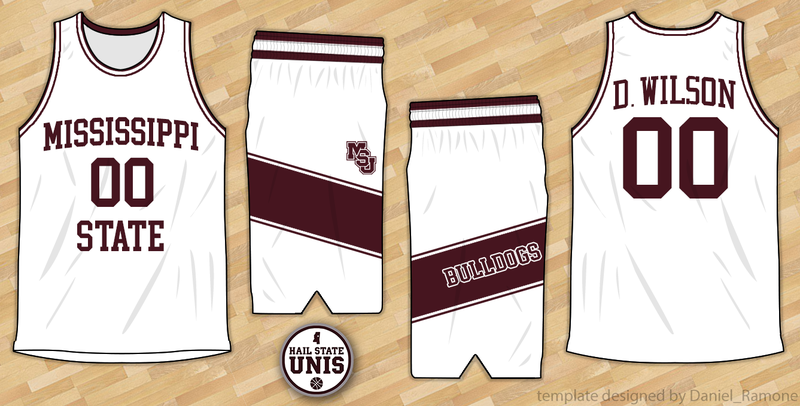 In the 87-88 season, the Bulldogs added the first alternate jersey in school history: a gray jersey following the same template as the 86-87 uniforms, with white numbers and wordmark outlined in maroon, maroon and white striping, and a circular shorts logo. 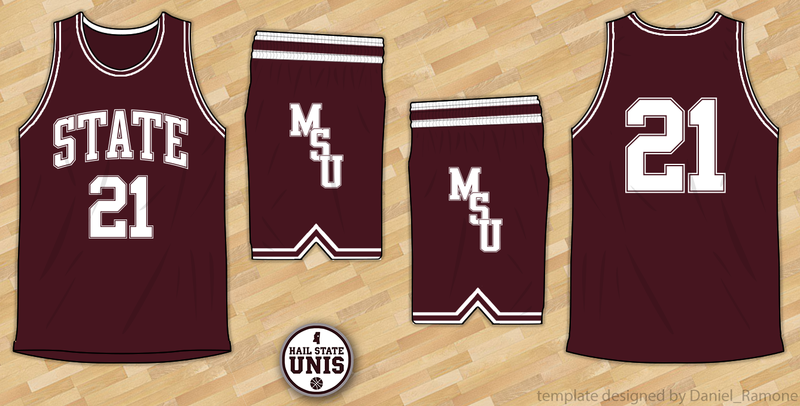 It was worn until the 89-90 season. 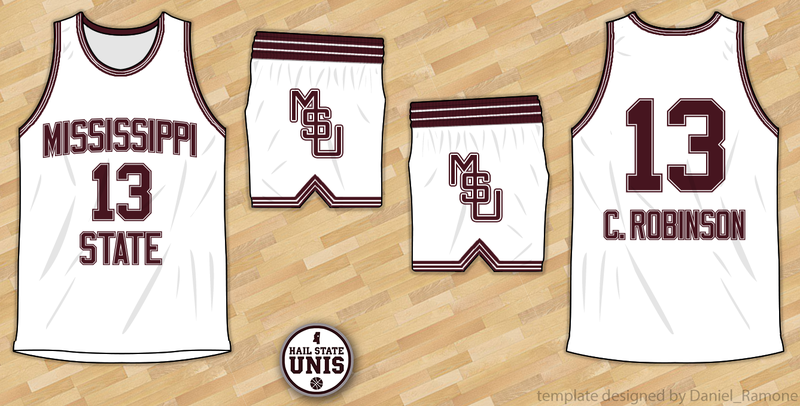 In 88-89, the wordmark on the white and maroon jerseys was altered. 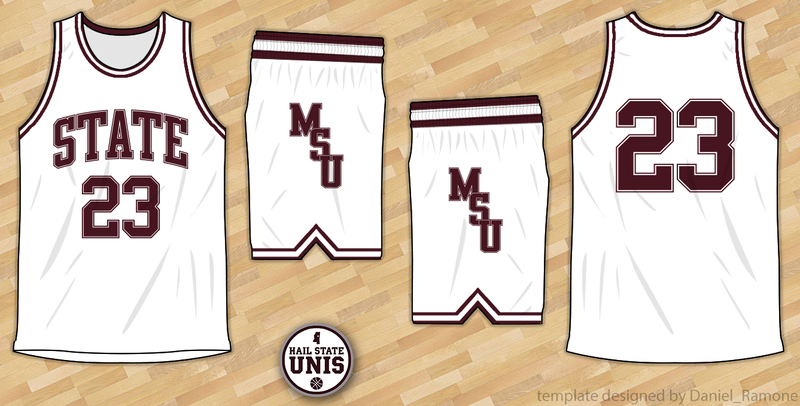 In 89-90, the white jerseys were altered yet again, with gray removed, the wordmark/outlines altered again, and an Oklahoma State style "MSU" shorts logo. In Bob Boyd's final two seasons, the uniforms were altered slightly. 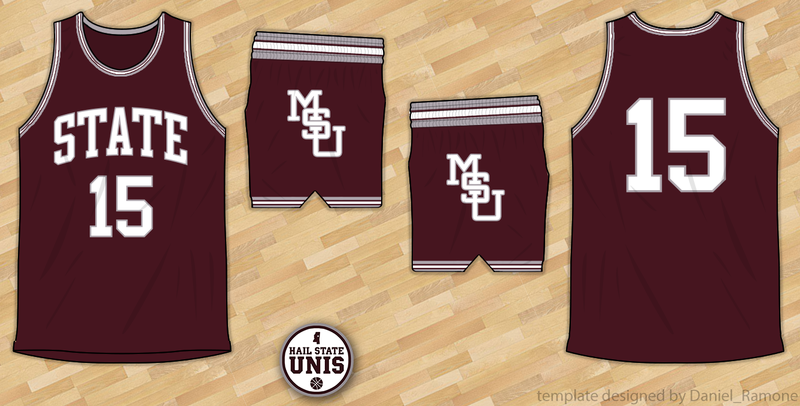 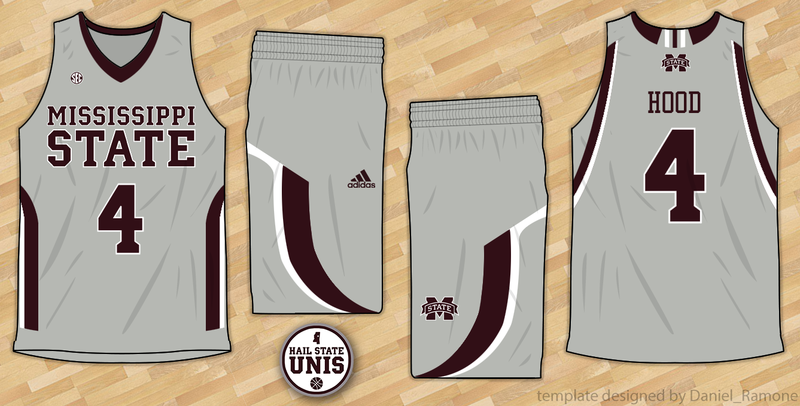 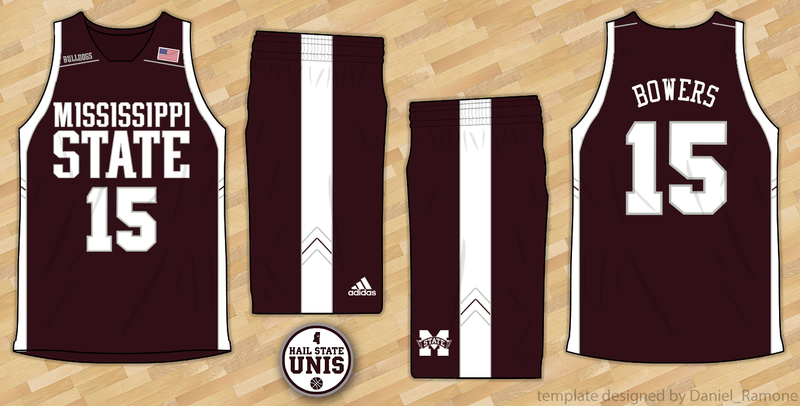 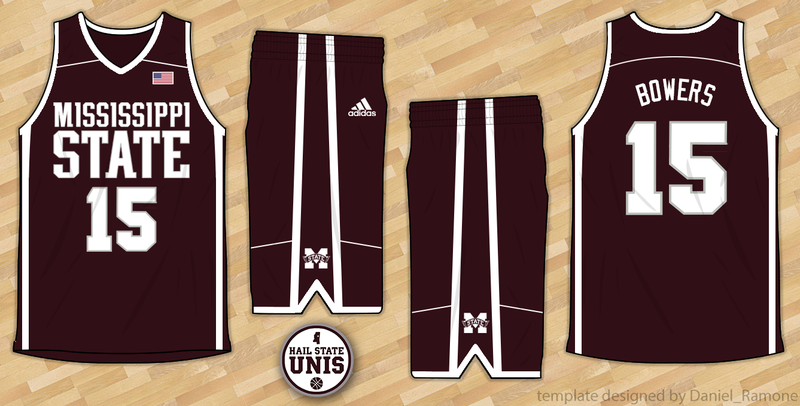 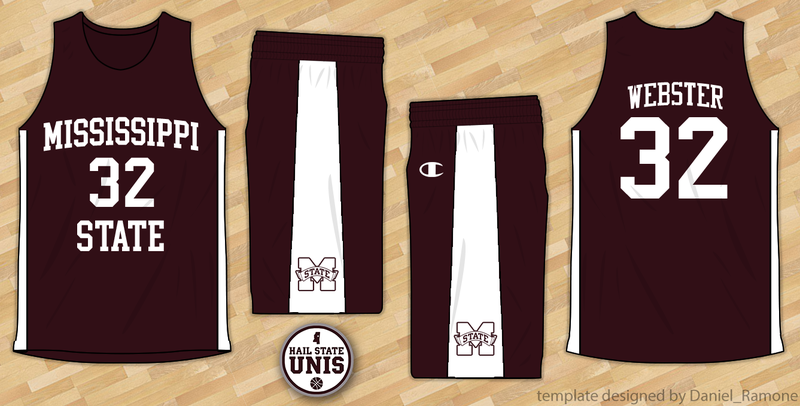 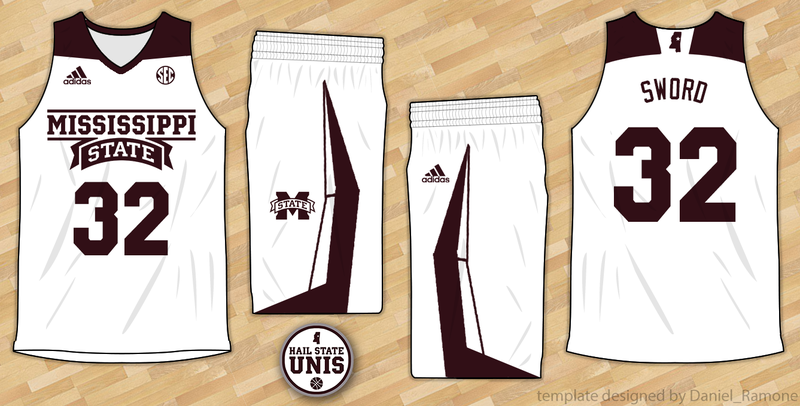 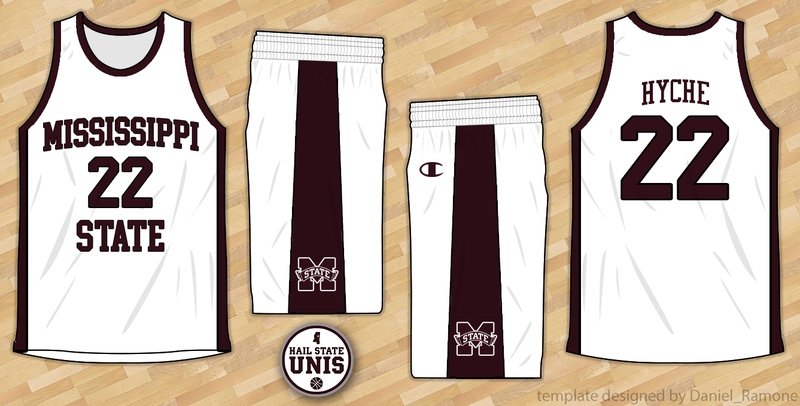 The front design with double outlines stayed the same, as did the interlocking "MSU" shorts logo. 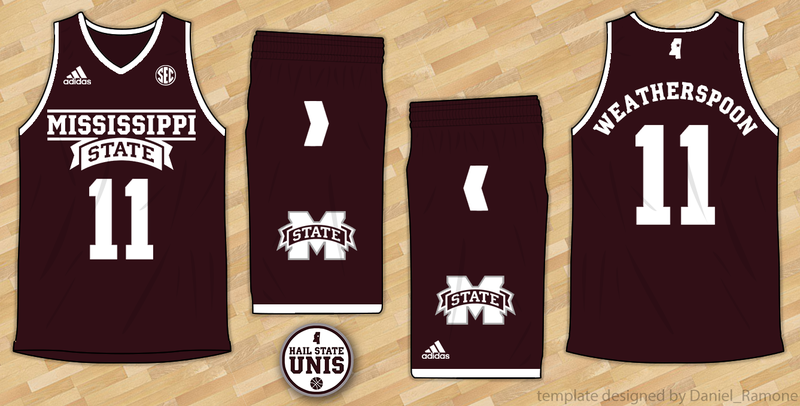 The changes included the addition of player names underneath the number on back and a third stripe to the striping pattern on the collar/neck, waistband, and shorts bottom. 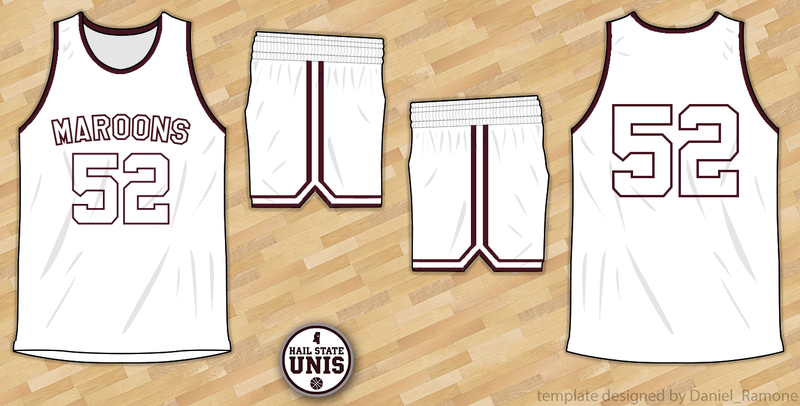 Bob Boyd became head coach in 81-82; for his first three seasons, the uniforms were given a more constrained design. 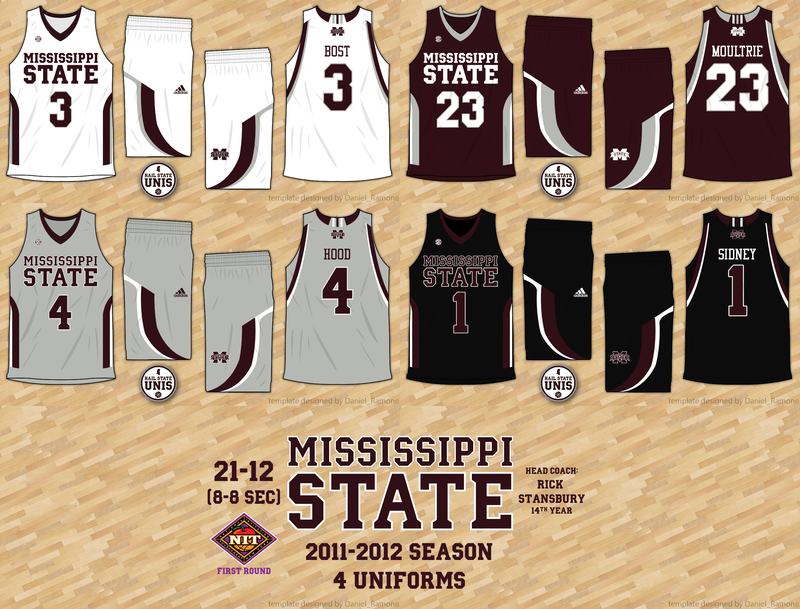 The fronts featured the "Mississippi" - number - "State" design, but in simple maroon and white. 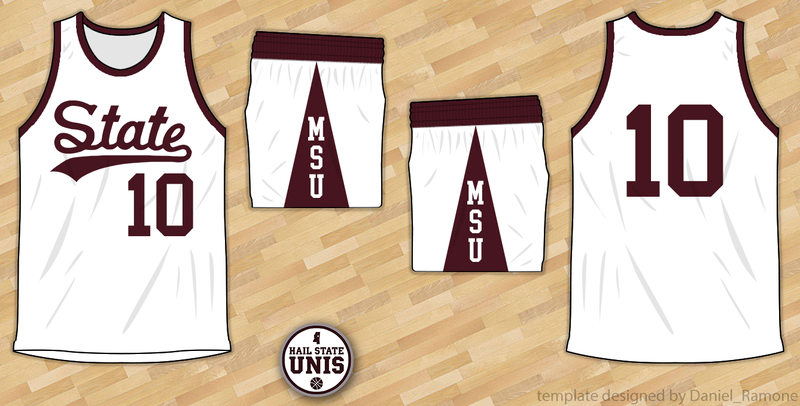 The numbers, wordmark, and interlocking "MSU" shorts logo all featured double outlines; the collar/neck, waistband, and shorts bottom all featured a double-stripe design. 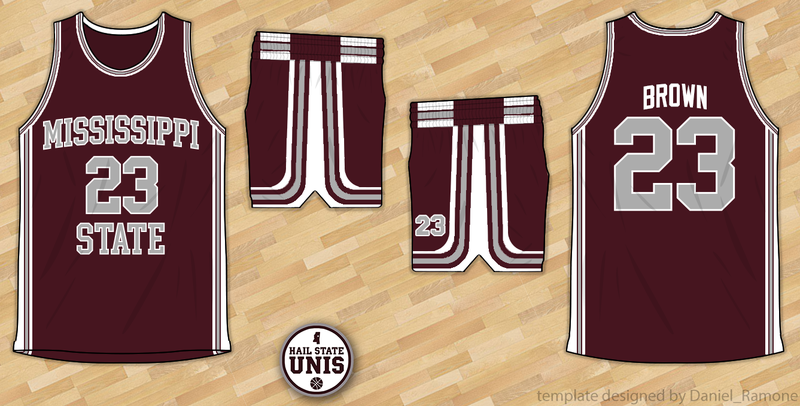 One of the coolest basketball uniforms design in school history, the 77-78 through 80-81 uniforms featured silver heavily and had huge, loud stripes down the sides. 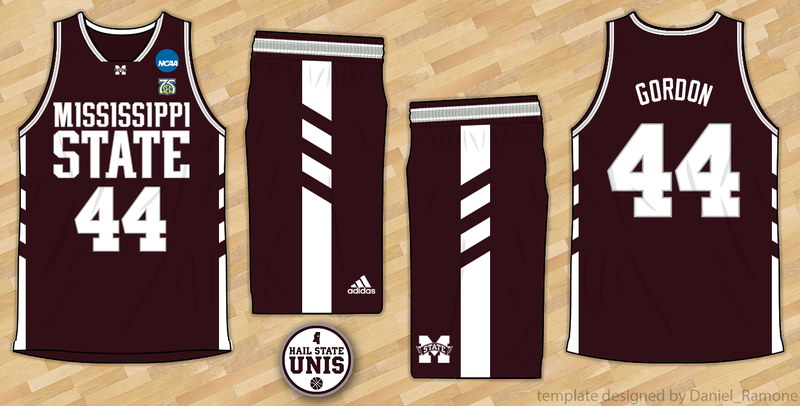 Using the "Mississippi" - number - "State" design for the first time ever on a varsity jersey, both the maroon and white jerseys featured silver numbers and wordmarks (outlined in maroon on the white jerseys and in white on the maroon jerseys). 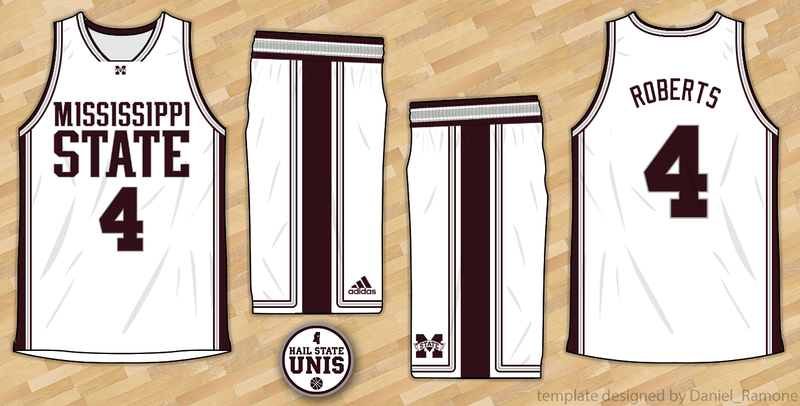 The collar/neck, side panels, and waistbands featured white, maroon, and silver striping. 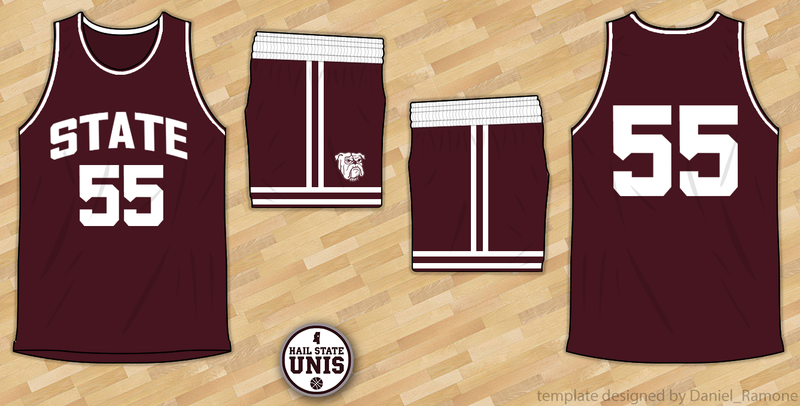 The shorts had wide stripes that started on the side and curved along to the bottom, taking up a lot of real estate on the short shorts of the day. 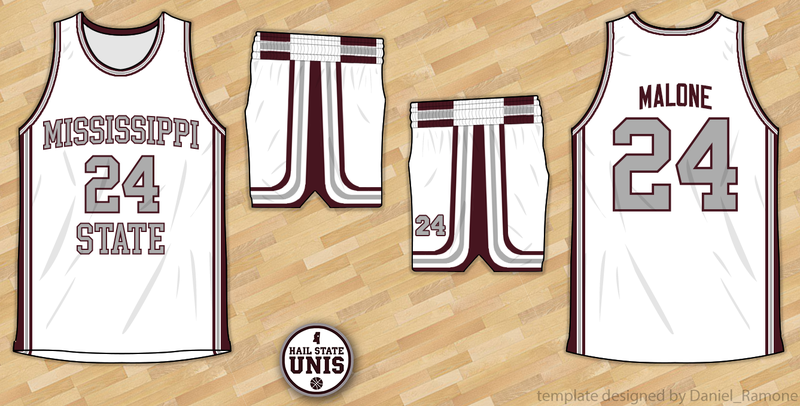 Couldn't have possibly been more "70's." 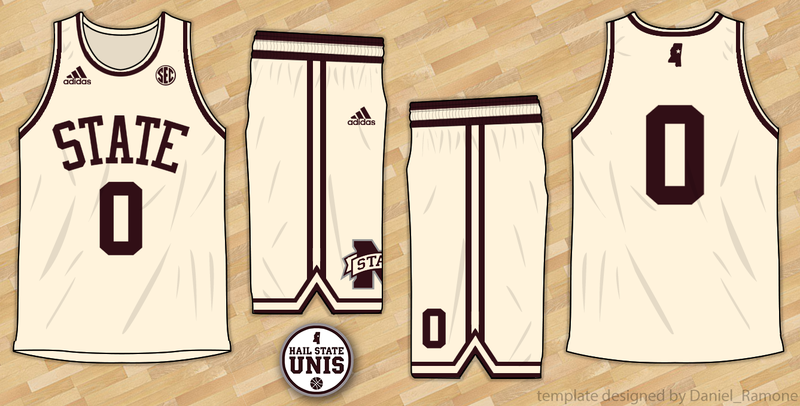 Worn for three seasons in the mid 70's, the script "State" uniforms were the first huge design change in 15 years. 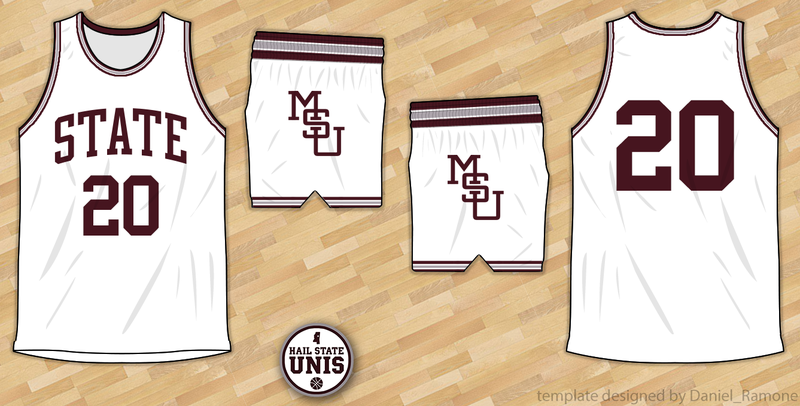 With a large, beautiful script on the front and the triangle "MSU" design on the shorts, these were radical in comparison to State's previous uniform designs. 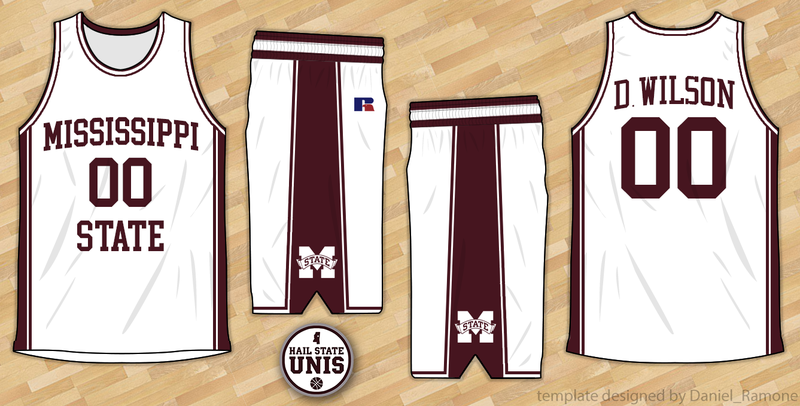 Throwbacks to these uniforms were worn in the 2018 season; ironically, several days after the throwbacks were worn, Ole Miss hired Kermit Davis Jr. to be their new head coach. 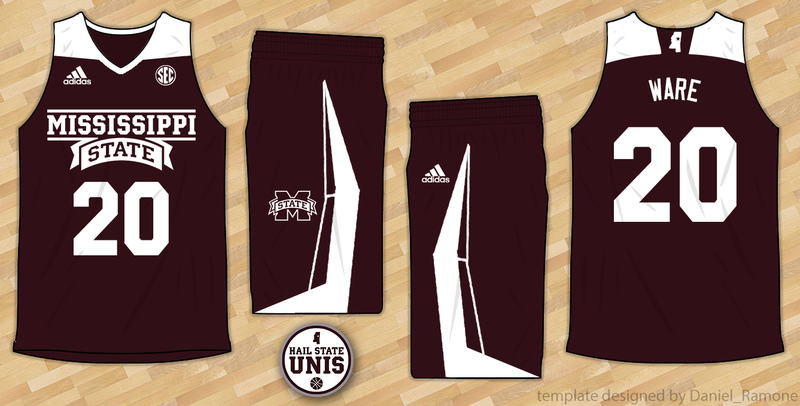 Why is that ironic? 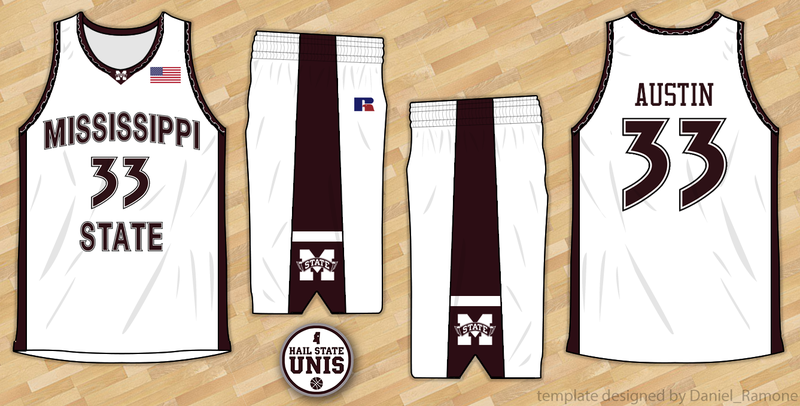 Kermit Davis Sr. was the head coach at Mississippi State when these uniforms were originally worn. The 70-71 through 73-74 uniforms were more or less a throwback to the 59-60 through 64-65 uniforms. 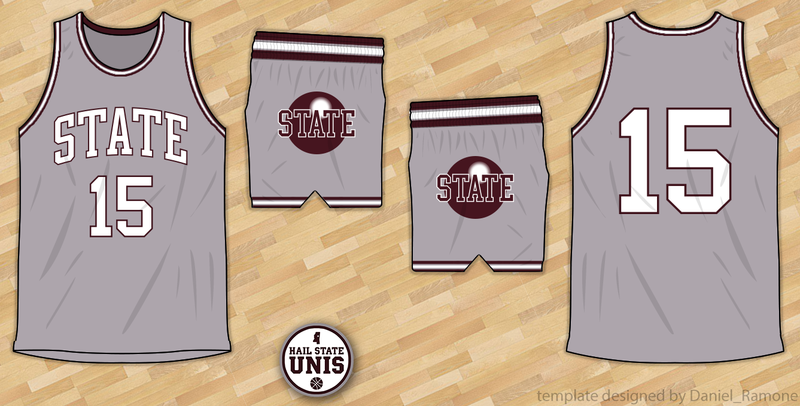 The only differences were a slightly different font for the "State" wordmark and the lack of a number on the shorts. 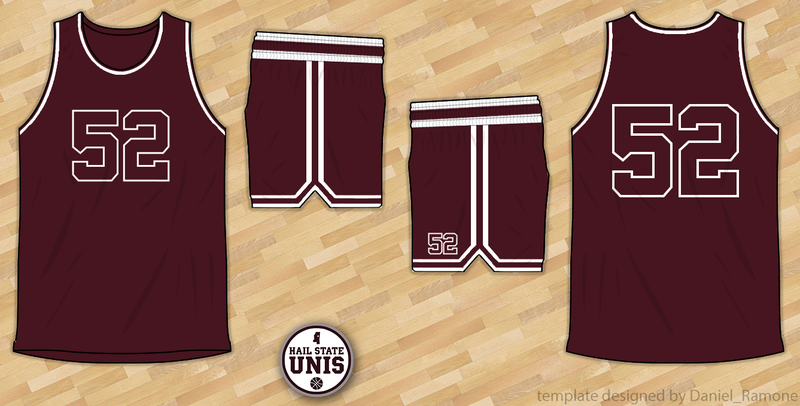 An interesting note about these seasons is that some players would still wear the jerseys from the 68-69 through 69-70 set, which were similar but featured a "State" wordmark that was in a wider, bolder font. 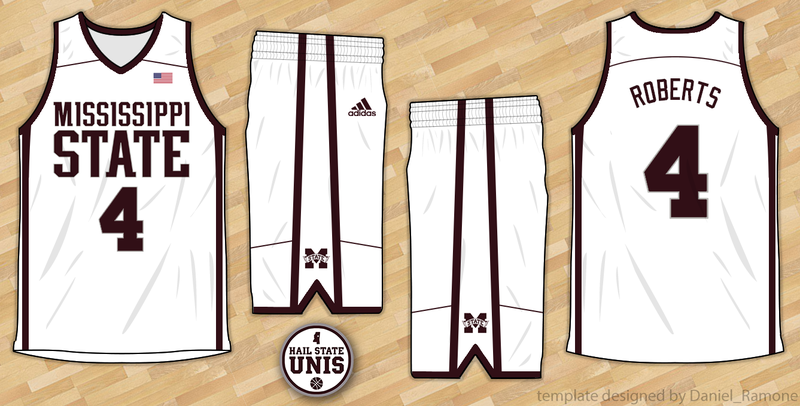 This created a mis-matched, non-uniform look at times. 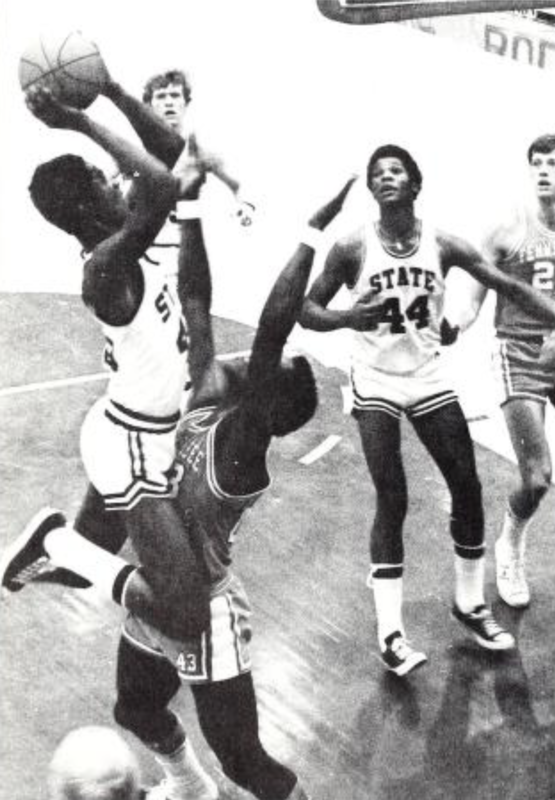 Definitely something you'd never see happen today. 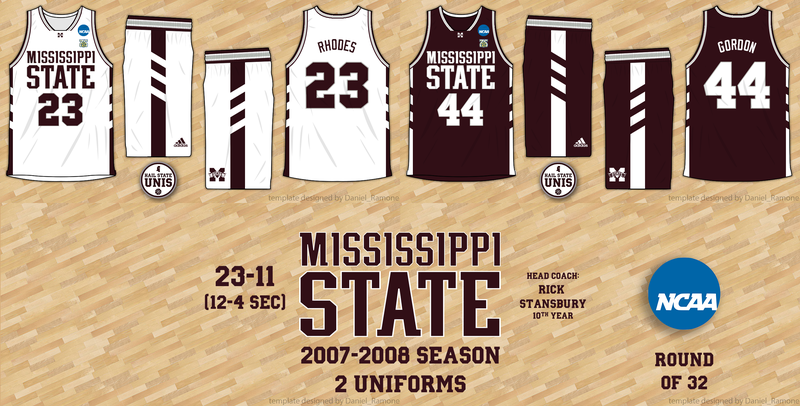 These two seasons' uniforms featured a wider, bolder font for the "State" wordmark. 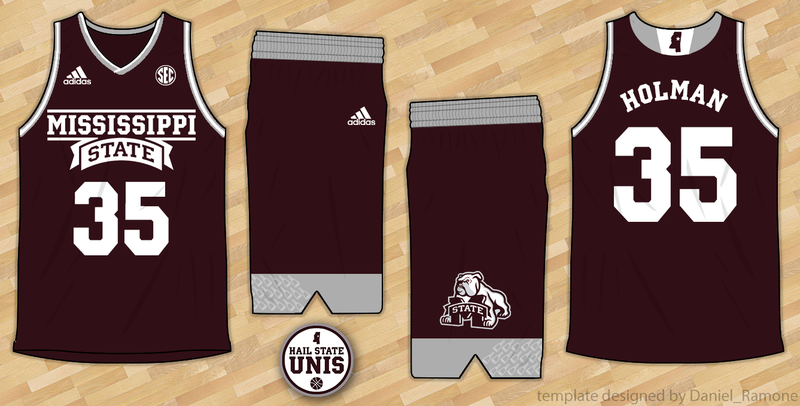 The shorts stripes were simplified from the previous set and the waistband was made a solid color (white on maroon, maroon on white). 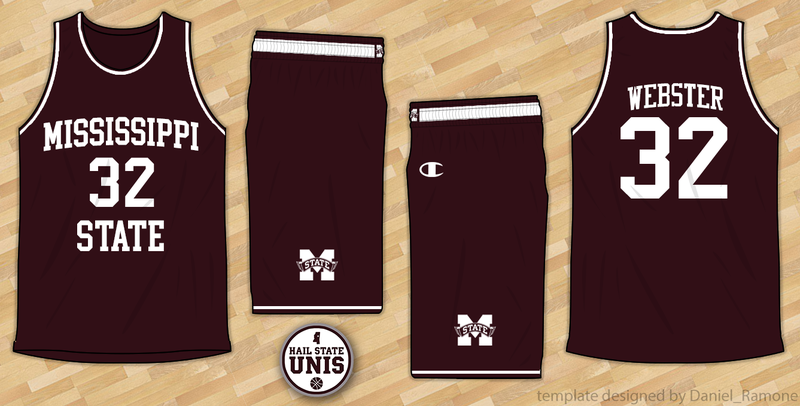 A Bulldog logo on the shorts is the defining feature of these uniforms. 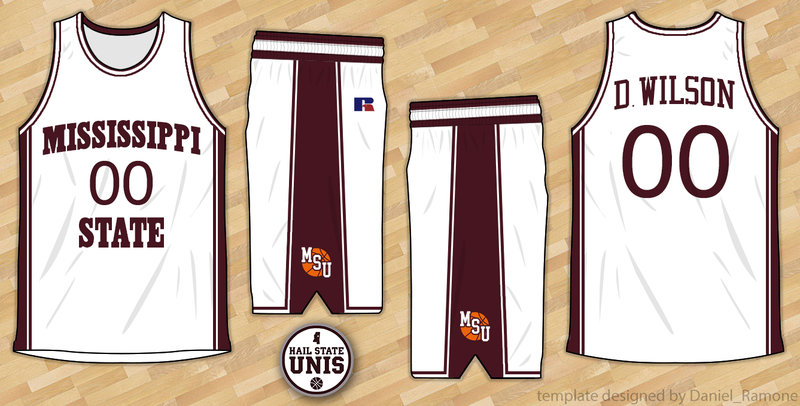 ​As part of a league-wide throwback movement, these uniforms were the basis for State's first ever throwback uniforms worn in 2006. 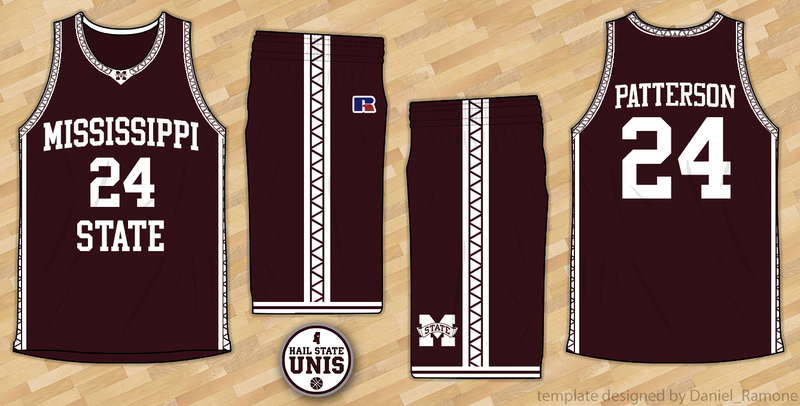 In the mid 60's, the Bulldogs' uniforms featured a more complicated shorts striping pattern and a thinner, less serif-heavy wordmark font. 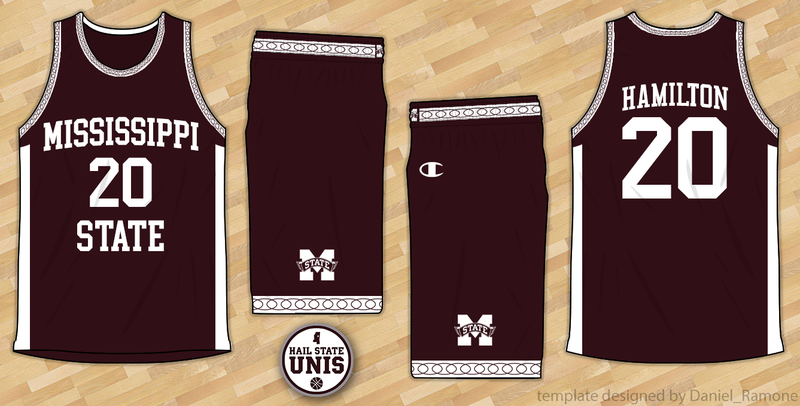 Best known for being worn in the "Game of Change", this is probably the most "classic" Mississippi State basketball uniform design. 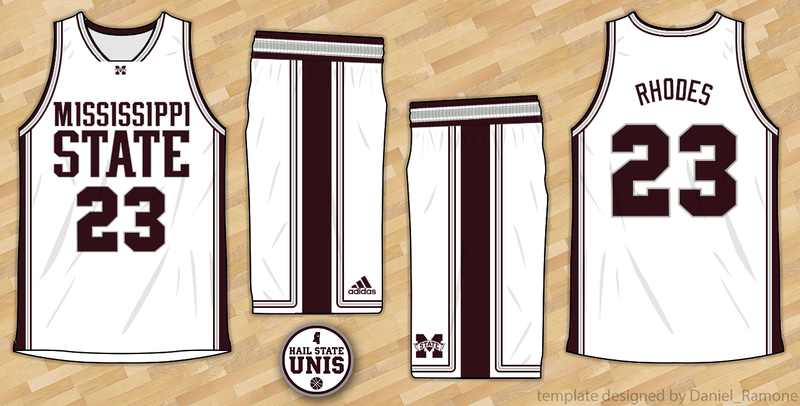 With a simple "State" on the chest, a single stripe on the collar/neck area, traditional striping on the shorts, and the number on the shorts, this look was brought back via cream throwbacks in 2016. The first (and thus-far only) player to ever have his number retired as a basketball player at Mississippi State is #52 Bailey Howell, who played at State for three seasons, from 56-57 through 58-59. 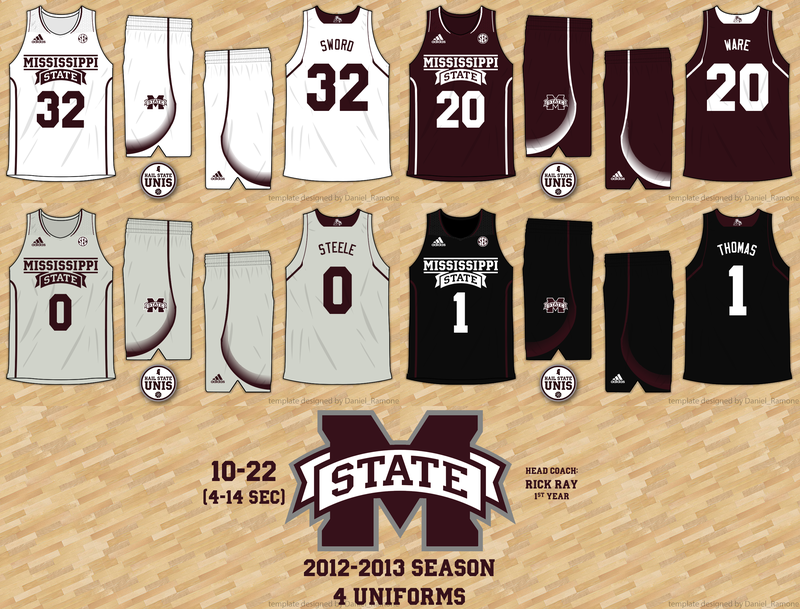 During his three seasons, State's white uniforms featured white on white numbers and a white on white "Maroons" wordmark. So far as I can tell, two maroon uniforms were worn during Howell's time at State; one featuring maroon on maroon numbers and one featuring solid white numbers. 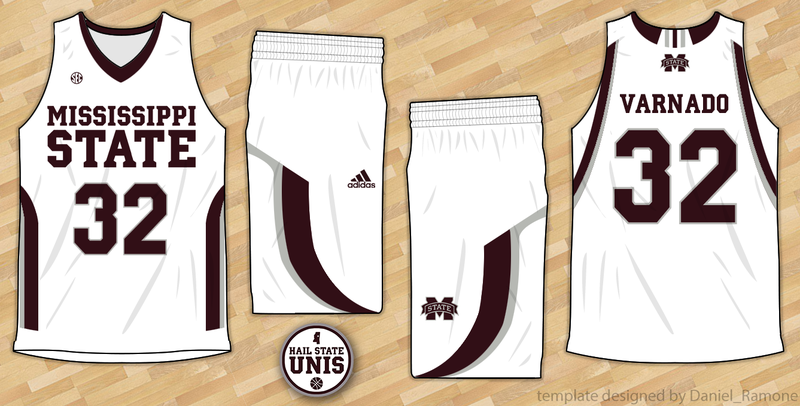 Neither had a front wordmark and both used the same shorts design.